When they’re injured or ill, a vet is always the best bet for your pet! However, in an emergency, basic first aid treatments can benefit your pet until you can transport them to Quarry Ridge Animal Hospital or to the nearest emergency clinic. Remember that first aid is not a substitute for veterinary treatment—any first aid treatment should be followed immediately by veterinary care. 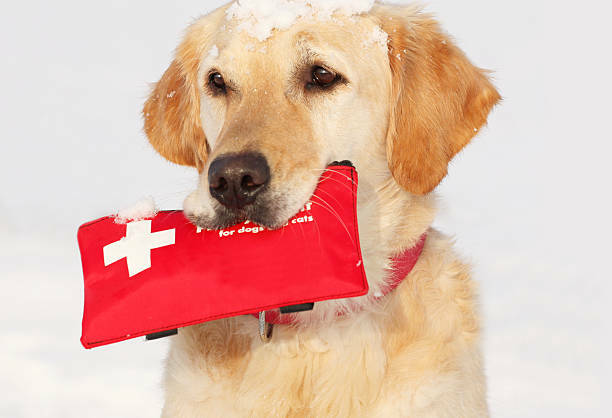 Be prepared for an emergency by creating a pet first aid kit before you need it. If you and your pet spend time in the car or if you for on regular adventures away from home, it’s a great idea to keep one kit at home and one in your vehicle. 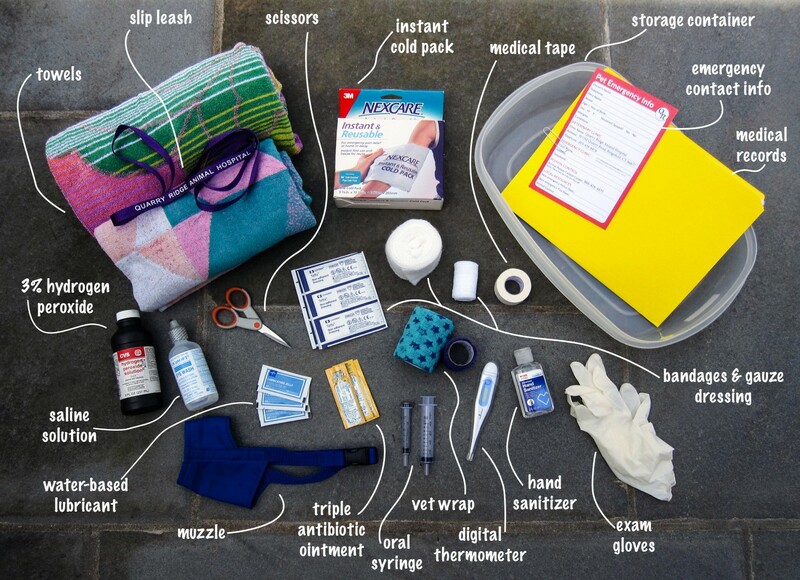 We packed our first aid kit in a durable 1.5 gallon plastic food storage container. A tool box, a tackle box, or a sturdy backpack are also good options. An ideal container is brightly colored and clearly labeled so that it’s recognizable and easy to find when you need it. Especially vaccine history, current medications, age, and weight. Be prepared with contact information for Quarry Ridge Animal Hospital, the emergency clinic nearest your home, Poison Control, and local police and fire departments and Animal Control. Use rolled gauze to wrap wounds or muzzle an injured animal. Use bandages to control bleeding and protect wounds. Do not use traditional Band-aids on pets’ wounds. Secure gauze or bandages. Do not apply adhesive materials to fur. Use towels to restrain, muzzle, or transport an injured animal. Towels can also be used to clean, protect, or pad wounds and injuries. Never use a muzzle on a vomiting animal. Normal temperature for dogs and cats is 100-102.5o Fahrenheit. Flush wounds or administer fluid medications. Cut bandages and tape. Trim fur surrounding wounds, if necessary. Prevent cross-contamination between you and your pet while administering first aid. Clean hands before and after treating a wound—do not use on your pet. Protect wounds or eyes or lubricate a thermometer. Quickly slow bleeding from minor cuts, e.g. a nail that was clipped too closely. Never administer to induce vomiting before consulting a veterinarian or a poison control center. Do not treat wounds with hydrogen peroxide. Store hydrogen peroxide in an opaque bottle. Never administer to absorb poison unless instructed to do so by a veterinarian or a poison control center. Check expiration dates before administering. Cleanse wounds, rinse burns, cool an overheated pet by wrapping with wet towels, or rehydrate. Reduce swelling and inflammation after a bee or wasp sting, sprain or strain, or bruising. Do not apply cold packs directly to skin—use a towel in between. Do not use cold packs to cool an over-heated pet. 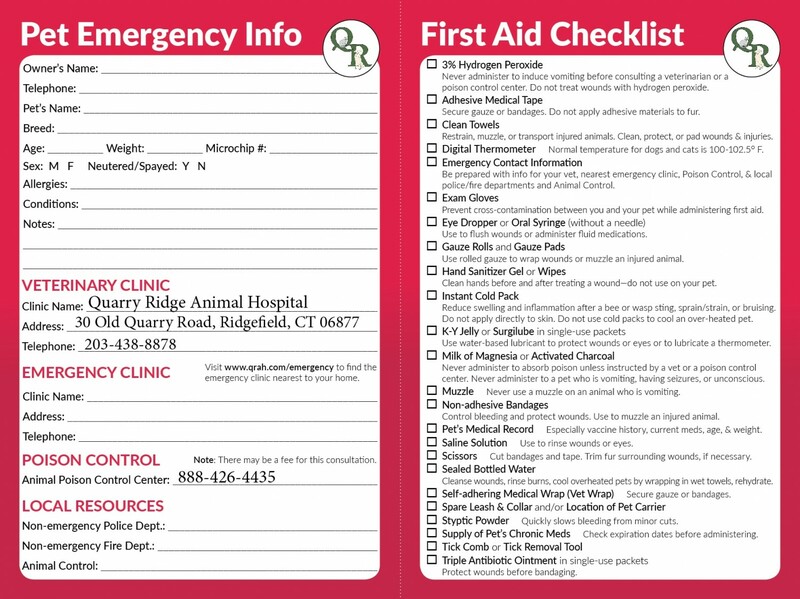 One item you’ll want to include in your first aid kit is a Pet Emergency Info card with vital information about your pet and contact information for Quarry Ridge Animal Hospital, the emergency clinic closest to your home, Animal Poison Control, and phone numbers for local police and fire departments and Animal Control. You can also find important information like your pet’s vaccine history, the names and dosages of their current medications, their most recent weight, and their microchip number in your online Pet Portal or the MyPetsWellness mobile app. Be prepared by writing this information down before you need it! We’ve created a printable Pet Emergency Info card that you can fill out and keep in your first aid kit or on your refrigerator. Simply download and print the document, fold on the white dotted line, trim the white border, and glue or tape along the edges to create a double-sided card with a First Aid Kit checklist on the back!